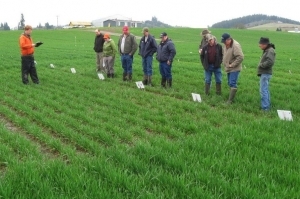 A reference for weed control practices and herbicides used in cropping systems or sites in Idaho, Oregon, and Washington. Overuse and dependency on one type of herbicide for weed control can result in a population of herbicide-resistant weeds. Tips and techniques that can help manage and control the spread of invasive weeds in Oregon. Stunned researchers at Oregon State University couldn't help but question themselves. Once, twice, three times in early May -- in two different labs -- they analyzed DNA extracted from wheat plants grown on an eastern Oregon farm. Gov. John Kitzhaber has declared May 19-25 Invasive Weed Awareness Week, and, according to the Oregon Department of Agriculture, the state needs to be diligent in its war against weeds. Two consecutive rainy springs are being cited as the primary reason for an influx of roughstalk bluegrass in Willamette Valley grass seed. You will learn how to use pesticides safely and effectively while protecting yourself, other applicators and the environment.